Max Traxxx brings you the coolest race track ever with Tracer Racers Glow Powered Racing! Tracer Racers utilize Light Tracing Technology to blaze streaks of light across the patented Max Traxxx Glow-in-the-Dark track. You have never experienced racing like this before! Tracer Racer racing cars and trucks feature undercarriage lights that not only make these cars look almost like they are hovering rather than rolling - the lights also leave glowing streaks in their wake showing how the racers are "burning" up the track!! 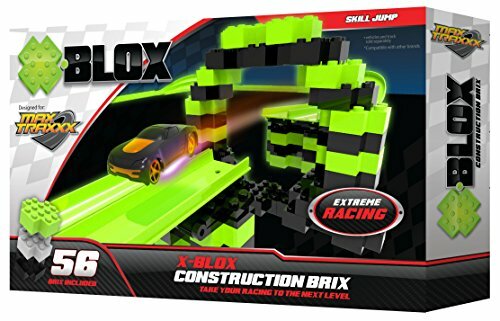 All Max Traxxx Tracer Racers and Remote Control track sets are customizable by adding cool track modules like this one - add X-BLOX construction bricks to your track set to "elevate" the fun. Set up in a dimply lit room for racing excitement that will set the darkness ablaze! Skullduggery is proud to offer their Max Traxxx lines of quality race car tracks and model car kits that combine discovery and fun, providing kids with many hours of exciting enjoyment! Just the sort of quality product you have come to expect from Skullduggery, makers of the fine Eyewitness and Smithsonian casting kits that combine creativity, discovery, and learning into one exciting artistic journey! Discover all that Skullduggery brands have to offer your child! Max Traxxx brings you the coolest racing experience ever with Tracer Racers Glow Powered Racing! Add these X-BLOX construction bricks and track risers to your Max Traxxx track set (sold separately) to 'elevate' the racing fun! All Max Traxxx track sets are customizable by adding cool track modules like this one - see all the track add-on modules to create your most exciting track configuration! Then set up your track combination in a dimply lit room for racing excitement that will set the darkness ablaze! If you have any questions about this product by Max Traxxx, contact us by completing and submitting the form below. If you are looking for a specif part number, please include it with your message.